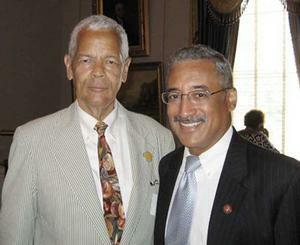 Along with remembering Julian Bond as a great social activist, we recall his visual arts interest. New York art patron and collector Nancy L. Lane worked closely with Julian Bond when she was a member of the National Board of the NAACP. She recalls that Julian Bond and his spouse Pamela Horowitz collected art and that he took a particular interest in some artists. One example of Julian Bond’s art-related interest stands out in Nancy Lane’s memory. It's from when she helped Bond arrange retreats for the NAACP board at the Harvard Business School. One afternoon while they were at the retreat, she accompanied Bond to meet with then-Harvard University President Neil L. Rudenstine in his office. (Rudenstine’s term of office at Harvard was 1991-2001, so the meeting took place during that time). Julian Bond presented Neil Rudenstine with a signed Jacob Lawrence lithograph as a gift from the NAACP National Board. After Bond's passing, Neil Rudenstine's spouse, the art historian Angelica Rudenstine, said "Neil was (and remains) very touched by the gift" which now hangs in their Princeton NJ home. The lithograph is: Aspiration, signed and dated 1988, 11/200. "Gift to NLR from the NAACP." Nancy Lane is an IRAAA advior. In the mid-to-late 1990s Julian Bond was a paying subscriber to the print IRAAA journal. He called the IRAAA office once about an art matter but not a usual one such as a question about an artist or a missing issue. I took the call and, while I don't remember the details, I believe it may have related to the Fall 1997 IRAAA issue. The cover story of that issue was on the controversy then erupting in the African American art community about emerging artists Kara Walker and Michael Ray Charles who were creating black caricatures such as pick-a-ninnies in their works. What I do distinctly recall is that Julian Bond was calling from an airport and visual art was on his mind as well as catching a flight. In wondering to what extent Bond was interested in visual art, I did a quick search and discovered a historically-significant connection. Julian Bond's father, Horace Mann Bond, figured in the renowned Barnes collection of modern art being administered by Lincoln University, a historically black institution in Pennsylvania. Horace Mann Bond was president of Lincoln University from 1945 to 1957. 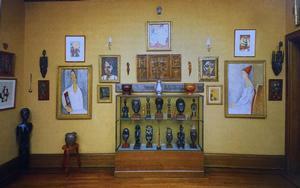 Albert Barnes collected outstanding works by Van Gogh, Cezanne, Renoir and Matisse which he displayed with splendid African objects in his mansion in nearby Merion, PA. A friendship developed between Albert Barnes and Horace Mann Bond and Bond invited the collector to lecture on art at Lincoln in 1950. Around the same time, Barnes gave Lincoln University the power to nominate most of the trustees to run the Barnes Foundation, after his death. With a father who had first-hand knowledge of the great, foundational works of modernism, young Julian had a huge headstart in art appreciation. Other members of his extended family were accomplished designers. His cousin was the noted late architect, J. Max Bond. J. Max's mother, Ruth Clement Bond, designed quilts made by rural African American women. In late 2002-early 2003, Julian Bond began crusading vigorously against a coalition of Philadelphia-area foundations which sought to wrest Barnes Foundation board control from Lincoln and move the collection from Merion to a new building in Philadelphia. Unlike Bond's political crusades, this was a campaign that he could not win. The Barnes Foundation Board was reconstituted and the collection was installed in a new facility in Philadelphia which opened in 2012. As the life of Julian Bond (January 14, 1940–August 15, 2015) is celebrated, I hope we'll learn more about his artistic sensibility — for example, he was an English major at Morehouse and wrote poetry — and particularly more about his interest in the visual arts. Read about the connection between Horace Mann Bond, Julian Bond and the Barnes Collection here and here. 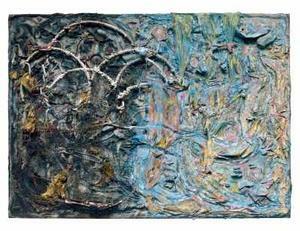 The full caption for the Dial piece is: Thornton Dial, Heaven and Hell on Earth, 1995. Corn husks, corncobs, dried mushrooms, roots, burned wood, clothing, bedding, toys, wire, metal, fabric, Christmas tree ornament, rope, carpet, paintbrush, other found materials, oil, enamel, spray paint, and industrial sealing compound on canvas on wood. Collection of the Souls Grown Deep Foundation.